The Harris Center is located at 425 Perry Street and is open Monday through Friday from 8 a.m. to 5 p.m. 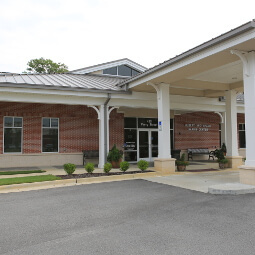 The Harris Center is home to the Parks and Recreation administrative offices as well as all 50+ programming including, bingo, movie night, book club, speaker series and multiple fitness classes. This facility is also equipped with a computer café that includes four desktop computers and one printer for public use. Priority of computer use is given to 50+ members of the community, but can also be used by anyone in the general public. If interested in using the computers, please check-in with the front desk staff. You can view the quarterly brochure for more information about the programs and classes that are offered at the Harris Center. If you are interested in offering a program at this facility, please contact Gabby Meredith, Community Programs Coordinator, at 334-501-2946. The activity room, meeting room and catering kitchen at the Harris Center are available for rentals. Please click on the Rent and Reserve tab on the bottom of the page for more information and rental forms.